« What do programmers really do? 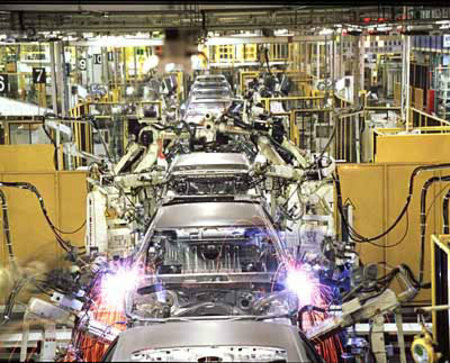 Agile and Lean Software Development adopted some practices from Toyota. Lean Software Development: An Agile Toolkit (by Mary Poppendieck, Tom Poppendieck) is an excellent book that review Lean practices and principles in details. This post focuses more on philosophy and the system of practices as a whole that can turn software development team into a smart reliable machine. Why customer will pay money for your product? How does your company creates value? Problems, needs and ideas are translated into units of development – functionality, user experience (interface, interactions, usability) and system qualities (performance, reliability, security, etc). A software development team transforms these pieces of requirements into a computer system using value-added and many not-so-value-added actions. The ultimate goal of Toyota Way is to eliminate non-value-added activities while keeping the best quality of the product. What is the process of creating value in your company? The most effective flow is one-piece flow – a customer need is immediately converted into a delivered software solution. In the same time this is the most demanding flow: a customer, designers, developers, testers and system administrators should be dedicated to the project, immediately available and work as one team together until the need is implemented in a live system. Toyota uses two additional principles to overcome challenges of one-piece flow: pull systems and leveling out the workload. However, Toyota Way says: “Flow where you can, pull where you must“. The big challenging goal is to turn eventually all the processes into one-piece flow. Kanban is a signaling system to trigger action. It adds to flow small buffers pulled by customer demand. Kanban allows optimal use of people and natural breaks in processes. Agile iterations and Scrum sprints are close to Kanban ideas. A team pulls new user stories every time-boxed iteration from the backlog to design, implement, test and deploy within the same iteration. However, it is not classical Kanban. An original idea would be to pull small batches of user stories for development after a team has finished a current batch (not at the end of fixed time iteration). In parallel, QA pulls implemented user stories for testing and so on. A customer can continue preparing next batches of work based on their priority of needs. 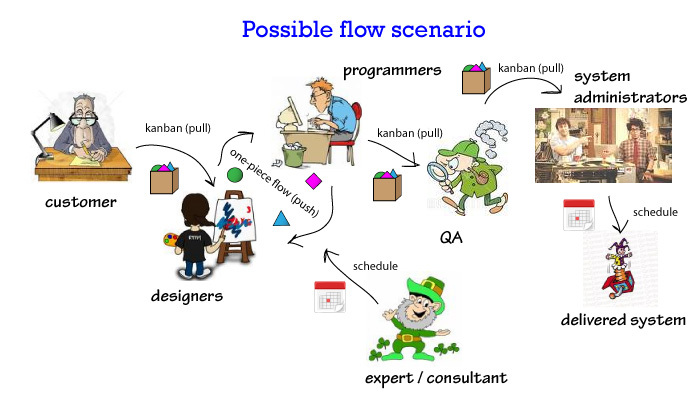 Kanban is effective way to synchronize people and teams work without bringing them into continuous flow, where they should be always ready for the next unit of work. The main idea of Heijunka is to level production by volume and activities mix. In software development workload could be leveled and scheduled when people could make reliable guess for what is expected. 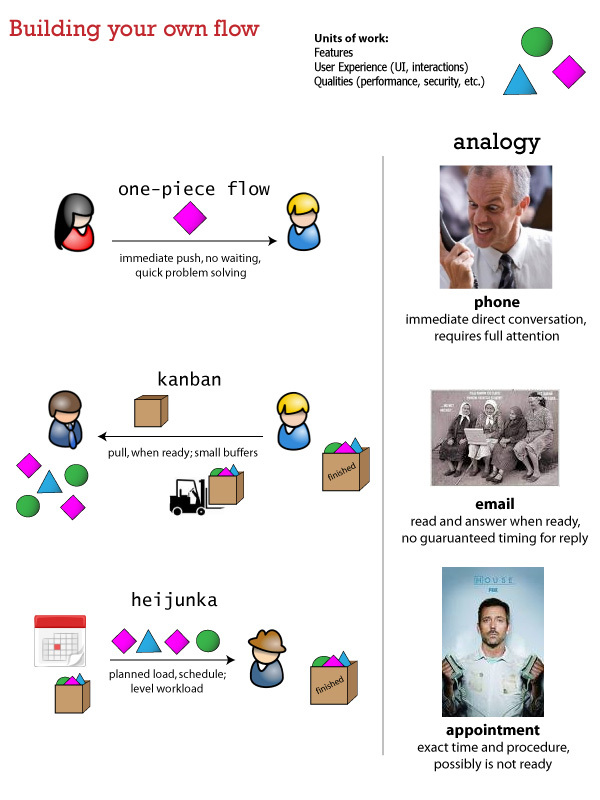 It is different from Kanban that works as just-in-time system adapting to the current workload. You cannot build reliable and optimal flow from the scratch based on a theory only. The best process for your projects will emerge as result of evolution, problem solving and eliminating waste. This is a topic of the next post. If some problem occurs in one-piece flow manufacturing then the whole production line stops. In this sense it is a very bad system of manufacturing. But when production stops everyone is forced to solve the problem immediately. So team members have to think, and through thinking team members grow and become better team members and people.